The fields of microfluidics and BioMEMS are significantly impacting cell biology research and applications through the application of engineering solutions to human disease and health problems. The dimensions of microfluidic channels are well suited to the physical scale of biological cells, and the many advantages of microfluidics make it an attractive platform for new techniques in biology. This new professional reference applies the techniques of microsystems to cell culture applications. The authors provide a thoroughly practical guide to the principles of microfluidic device design and operation and their application to cell culture techniques. The resulting book is crammed with strategies and techniques that can be immediately deployed in the lab. 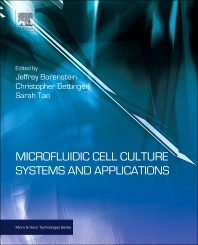 Equally, the insights into cell culture applications will provide those involved in traditional microfluidics and BioMEMS with an understanding of the specific demands and opportunities presented by biological applications. The goal is to guide new and interested researchers and technology developers to the important areas and state-of-the-practice strategies that will enhance the efficiency and value of their technologies, devices and biomedical products. Academics, Researchers and Scientists working in a variety of fields, including (but not exclusive to) Biomedical Engineering, Materials Science, Microfabrication, Pharmaceuticals, Stem Cells and Regenerative Medicine technologies. Jeffrey T. Borenstein is Laboratory Technical Staff at the Charles Stark Draper Laboratory in Cambridge, Massachusetts, USA. Dr. Borenstein is a Technical Director for several of Draper’s programs in artificial organs, tissue engineering and implantable devices. His expertise is in MEMS fabrication technology, biological microsystems and the development of microdevices for therapeutic clinical applications. Dr. Borenstein currently serves as Principal Investigator for projects involving the application of microsystems technology towards engineered tissue constructs for organ assist devices and drug discovery, as well as implantable drug delivery systems for hearing loss and other diseases. These programs are funded by the Department of Defense, the National Institutes of Health and several commercial sponsors. Sarah Tao is Senior Manager, New Technologies at CooperVision, Inc. She was previously Senior Member Technical Staff, MEMS Design Group at Draper University, and Research Professor Equivalent, Bioengineering and Therapeutic Sciences at the University of California, San Francisco, USA. Her research interests lie in the areas of biomaterials, nanotechnology, regenerative medicine, drug delivery, BioMEMS, microfluidics and cell culture.